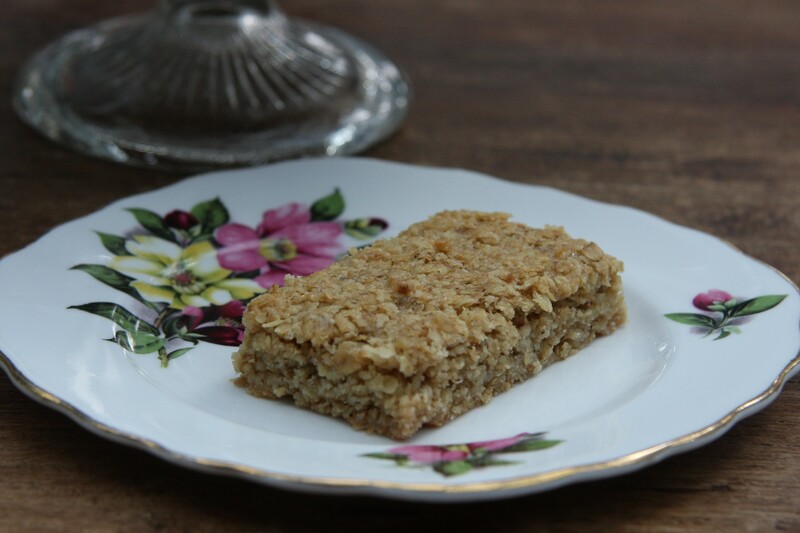 There are plenty of amazing flapjacks recipes out there with seeds, nuts, fruit and other additions but it is not always easy to find a good traditional flapjack recipe. I am a purist and don’t think flour has any place in a flapjack! This is the recipe that I have been using since I was a child. I know it was a recipe cut out from the back of a box of oats (Scotts Porage Oats, I think) and lived in my mum’s recipe book. Saturday afternoons we would nearly always make something quick: flapjacks, traybakes, cupcakes, scones, and so on. Flapjacks have always been one of my favourites. This was the easiest recipe to remember when everything was done in pounds and ounces: 8, 6, 4 and 1 (the 1 slightly messed it up but even so): 8oz oats, 6oz butter, 4oz Demerara sugar and 1 tablespoon golden syrup. I still can’t read or remember a recipe in grams as well as I can in ounces but I try! If you have Demerara sugar, use it, as it makes all the difference. They are really not as good with granulated or soft brown sugar. Real butter instead of margarine is definitely preferable, and if you use unsalted butter add a little pinch of salt as the salt really lifts the taste. Flapjacks are perfect as a last minute option if you have guests as they are quick and use store cupboard ingredients: no need for any eggs or unusual ingredients. Children love to make them: the only supervision they need is with the hob and the oven. If you manage to give these a try I’d love to hear how you think they compare with your favourite flapjacks. Set the oven to 180ºC. Grease and line a baking tray roughly 10″x7″. Measure out the butter, sugar and syrup into a large pan. Melt over a low heat until the butter has melted. Add the oats and mix well to combine. Tip the mixture into the baking tray and spread out. It is important to press the mixture down firmly and evenly with the back of a spoon, otherwise it will not hold together when baked. Put into the oven and bake for roughly 20-25 minutes or until golden brown all over: take care not to burn around the edges. Remove from the oven and allow to cool in the pan. 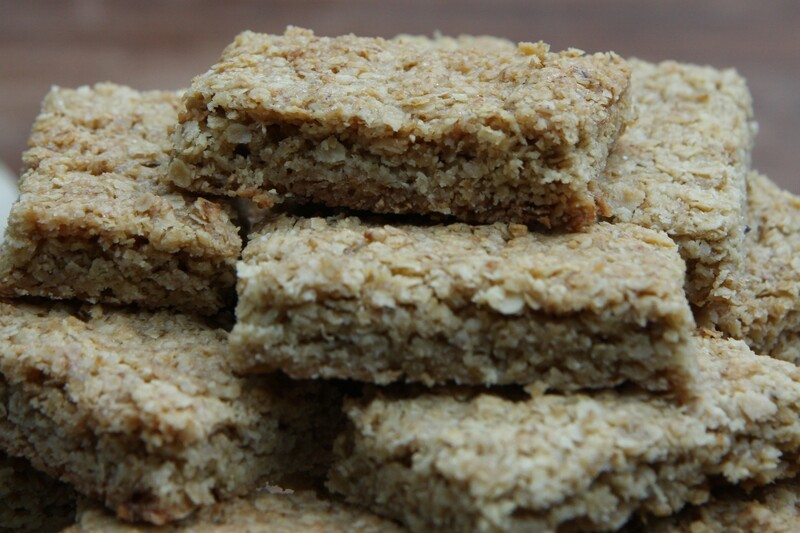 If you can resist it, it is much easier to cut the flapjack into squares or rectangles when cool. When I made these I thought I might have a few left over and checked online to see whether they could be frozen. The general consensus was that they could be, although as there weren’t any left over I haven’t had the opportunity to try it myself. Let me know what you think if make them! That sounds absolutely delicious, thank you for your comment! 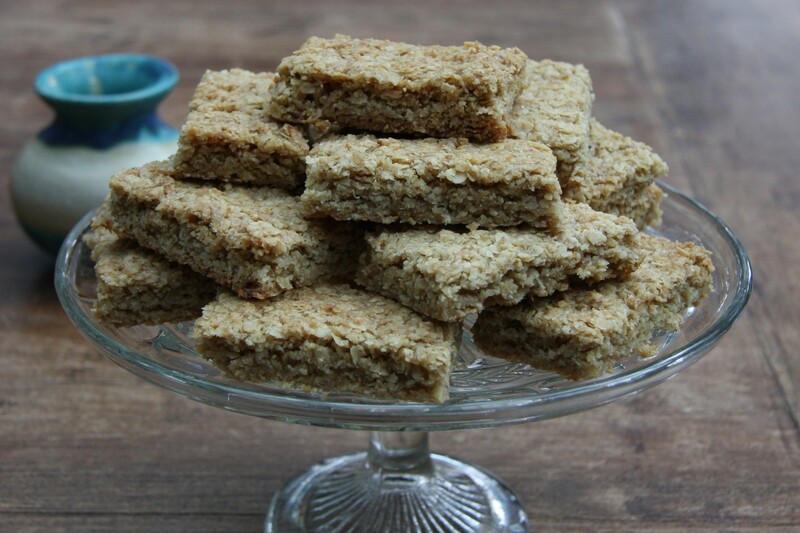 I’ve bought flapjacks, made flapjacks but never quite found that elusive flavour and texture that I remember from the flapjacks my late mother used to make more than 50 yrs. ago. She didn’t have any recipe books but did have a collection of scraps of paper and card cut from magazines and cereal boxes so, being brought up on breakfasts of Scott’s Porage Oats, it seemed a fair bet that this was the recipe she would have used. And—Bingo!!!!!!! At last the perfect, delicious flapjack of my childhood. Thank you – these will be a regular in my baking from now on. Thank you very much for your comment and I’m really glad that you have found your recipe at last. No doubt there are other old family recipes we share! Oh my goodness! I lost my flapjack recipe that I’ve been using for years, but as i haven’t had a request for making them in about 5 years, i forgot what the recipe was. Well, i won’t be using that one again if i find it, you’re recipe is much tastier and lovely and moist. Thank you for sharing it. Thank you very much for your lovely comment, glad you like them! Hi, thank you very much for your comment and apologies for taking so long to get back to you. If your flapjack is always crunchy it’s possible you have your oven on too hot – it might be worth reducing it by 10 or 20 degrees and seeing if that helps. Or maybe just reducing the time it is in the oven. Let me know how you get on! Thank you very much for your comment – so glad I could help. It really is the best ever recipe!